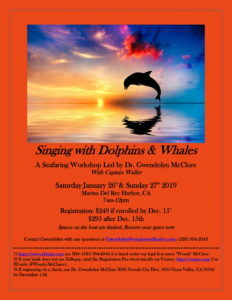 As it seems like we could all use some dolphin and whale love at this time, I’m presenting a seafaring workshop whereby we will go out to sea off the Marina del Rey Harbor in greater Los Angeles CA, and spend intimate time singing to the dolphins and whales during the peak season of whale migration on two dates: Saturday Jan. 26th and Sunday January 28th. 2) If your bank does not use Zellepay, send the Registration Fee electronically via Venmo: https://venmo.com Use ID info: @Wendy-McClure-1. ← CONCERT OF LOVE SONGS CHANGED TIL SUNDAY OCT. 21st!